The name "Illinois" came from the name of the native people in the area, via French, who where the first explorers in the area from Europe. 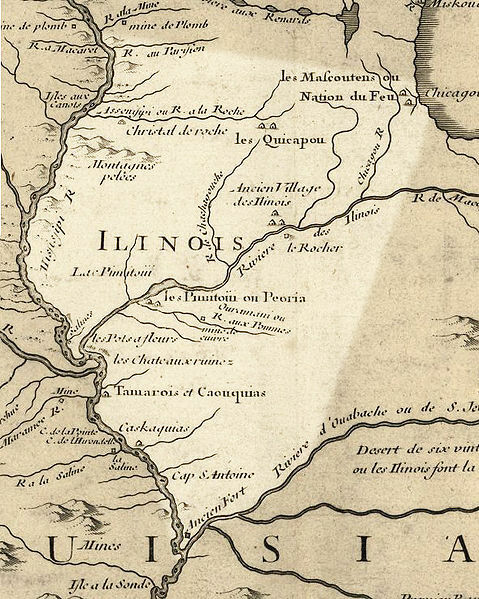 It was originally explored by the French in the 1600's via the Illinois and Mississippi rivers, and the lands fell under the control of the French Empire, until 1763, when it was passed over to the British. Following The American Revolutionary War, the lands where ceded to the new United States, and absorbed into the new Northwest Territory. It was then incorporated into the Louisiana Territory with Ohio entering the Union as a state, in 1800. 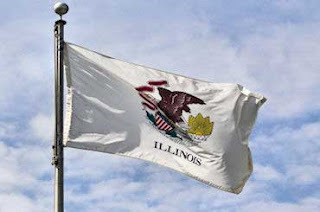 Finally, in 1809, the Illinois Territory was created, when Louisiana was admitted to the Union as an independent state. 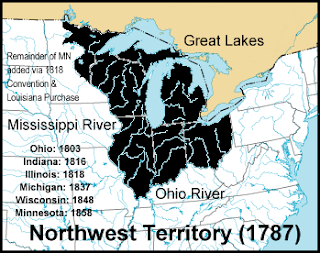 The northern parts of its lands where divided off in 1818, when Illinois was finally admitted as the 21st state. The state adopted its first Great seal in 1819, which essentially copied the Great Seal of the United States. Then, in 1839, a redesign saw the introduction of the second seal. Finally, the current seal was introduced as the third seal in 1868. It has a bald eagle pitched on a rock, with a shield in its talons. The shield uses a modified stars and stripes, with the 13 stripes and stars representing the original thirteen states. The eagle carries a ribbon in its beak up which is printed the state motto, "State sovereignty, National union." On the rock are 2 dates. 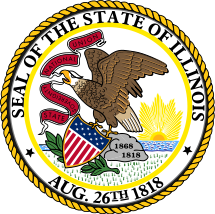 1818, the year in which Illinois was admitted formally into the Union, and 1868, the year in which the current seal was adopted. Surrounding the emblem in a ring, is the text "Seal of the State of Illinois" and "Aug 26th 1818" the date when Illinois became a state. Initially, the state did not have a flag, until Ella Park Lawrence, as state regent, began to campaign for one. She was ultimately unsuccessful during her time as state regent. However, she did not give up, and continued to campaign during her time with the Daughters of the American Revolution. 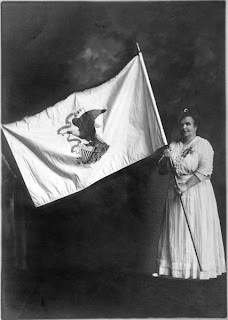 Finally, in 1914, a competition was held amongst the various chapters of the Daughters of the American Revolution to design a new state flag. The competition was carried out, and judged, with the winning flag finally becoming the new state flag in 1915. A simple white banner with the state emblem placed in the centre, with no additional text. In the 1960's, CPO Bruce McDaniel petitioned to have the states name placed on the flag. He argued that during the Vietnam war, many troops who came from Illinois failed to recognise their own flag! so, the addition of the state name was signed into law in 1969, and a new flag adopted with the state name below the emblem adopted in 1970. In 1918, a special banner was designed for the state. To commemorate 100 years as a state, a special flag was designed. This had 3 horizontal stripes of alternating white, blue, and white. And 20 stars arranged in a triangular form above and below the blue stripe on the hoist side. These represented the 10 northern counties, as well as the 10 southern counties that make up the state. Placed in the central blue stripe was a single white star, representing the state itself.